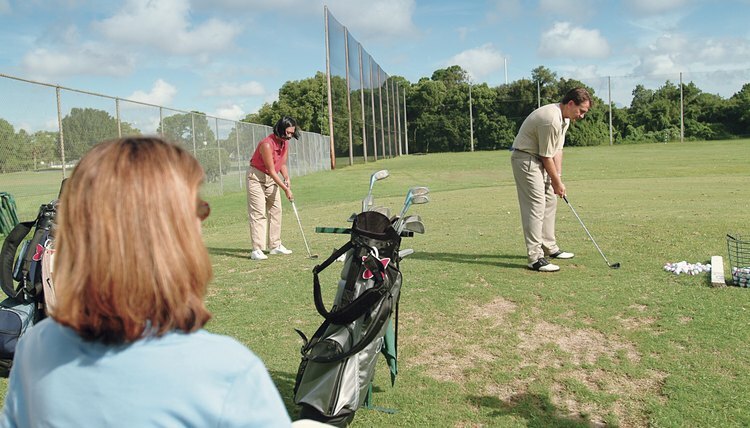 Golf swing drills are often performed on the practice range. Drills are activities golfers do to sharpen their shotmaking skills while also making practice time more enjoyable. Drills help you address specific swing flaws, build a more consistent swing and even improve your on-course strategy. Reduce tension and make a longer, freer swing. Tensing up at address often causes a swing that's too quick, and this poor tempo results in both a loss of swing speed and accuracy. The book "Master Strokes" recommends a "1-2-3 Hit Drill" to combat this problem. On the driving range, place a ball on the ground. Take your stance so the club is 2 feet from the ball and take a smooth, full practice swing. Move forward and take your stance again so the club is 1 foot from the ball. Make another tension-free practice swing. Set the club behind the ball and without hesitation take a third swing and hit the ball. Increase clubhead speed with a weight shift drill. Amateurs often have trouble shifting their weight from the right to left side on the downswing (for right-handed players), which is a factor in generating clubhead speed. On the driving range, take a smooth three-quarter swing with an iron and as you complete the follow through, lift up your right foot so it's completely off the ground. If you have difficulty lifting your right foot this way, it means too much weight is remaining on your right side during the follow-through. Practice this drill until you can comfortably lift your right foot and balance on your left. You'll learn to make a more complete weight shift. Learn to rotate your hips, not slide them on the downswing. If you slide too much with your hips -- and too quickly -- your lower body will get out of sync with your arms, resulting in slices or hooks. The instruction book "Private Lessons" recommends a drill where you picture a wall just outside (i.e., to the left) of your front foot. As you swing, try to finish with your belt buckle pressed against this imaginary wall. This will keep your left leg firm and your upper body rotating properly through the downswing. You can also try sticking an umbrella in the ground 4 inches outside your front foot. If you bump into the umbrella shaft during the downswing, you're sliding laterally more than is recommended. Play an imaginary round of golf on your home course -- while still on the driving range -- with this mental focus drill. Take out your driver and create a mental picture of the first hole, particularly the width of the fairway. Now hit the drive and see if it lands in the "fairway." Estimate how far it went and calculate how far you'd have to the actual first green on the next shot. Pick out the right club, aim for a specific target and hit the shot. Determine if you would have reached the actual green with the shot. Now imagine the second hole and try to hit that fairway and green. Continue this drill through nine or 18 holes. Keep track of how many imaginary fairways and greens you hit in the practice session and how this number increases as you repeat the drill. This drill will help you improve your accuracy -- and your confidence -- when you get out on the real course.